A combination of the alpinist’s two most important assets: strength and light weight. T-rated for rugged terrain. Forged NiCrMo steel head ensures maximum resistance of spike and adze. 7075 aluminum alloy single-curve bent shaft with aggressive steel spike offers a maximum range of comfortable positions for posting and anchoring. Two rivets and a nylon cap create a solid and durable connection between the head and shaft. Hand grip reduces sliding on the shaft. Equipped with standard alpine leash (Dragonne #1304). New color and graphic 2014/2015. An entry level technical axe for snow and ice. 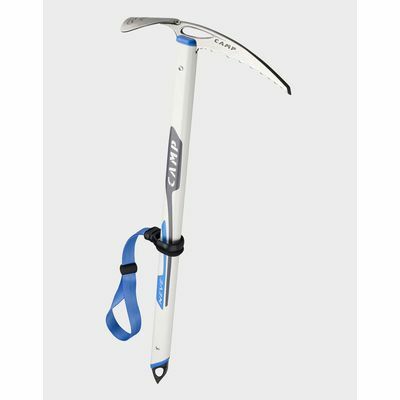 The steel head performs well on all terrain and the aluminium shaft keeps it lightweight, “Touring” leashes included.